Solomun Unveils ‘Customer is King’ video created entirely within video game Grand Theft Auto V - Track? !D. DIYNAMIC 's boss Solomun has unveiled the new video for his track 'Customer is King' which you can watch it below. 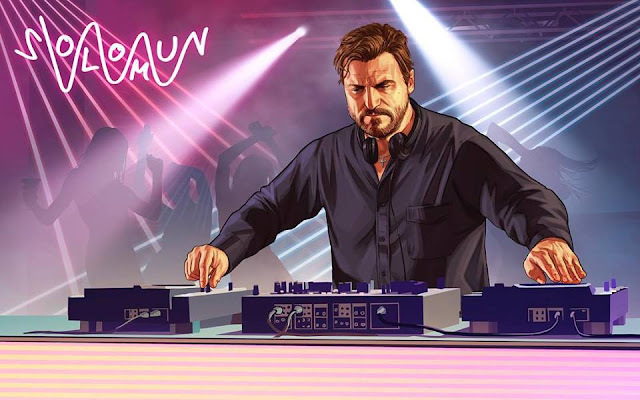 The video was created within video game Grand Theft Auto V, in which you can recruit Solomun as resident DJ in the fictional city of Los Santos similar to Los Angeles. Since last year we are talking, meeting and laughing with very strange but creative people who run a very successful computer game, called GTA. And we always had a very special video idea for the 100th release of @diynamicmusic which reflects the odd title: „Customer Is King“. What more can you dream of? And what serendipity: After months of inspiring talks and actions we now find in their latest game update a nightclub where I alongside other colleagues are performing. Truly amazing! This is the first music video that Rockstar Games ever did and I feel blessed and honored to present it to you guys now. Special thanks to Sam and his lovely gang of Rockstars! GTA Online: After Hours Featuring Solomun, Tale Of Us, Dixon and The Black Madonna. Partner with legendary impresario Tony Prince to open and operate a top shelf Nightclub featuring world-class DJ acts Solomun, Tale Of Us, Dixon and The Black Madonna, and use it as a front for the most concentrated network of criminal enterprise ever to hit San Andreas. GTA Online: After Hours is available July 24.Solomun is the first, while Tale Of Us enters the game on 31st July. Also watch The Black Madonna punches a cop in the face here.